Great Britain Stamp and postmark news update. Before we go for our main summer break, a quick round up of news items that have been reported recently. 1. BE reports that the Dog Awareness slogan postmark has been used at Chester Mail Centre in the last few days. I'll add a picture when I have it. Not the first time that Chester has been out of step - they were still celebrating the Royal Princess on 16 June! "The postmark will be applied to stamped UK mail from Friday 7 to Monday 31 August", ie delivered in that period, and thus used before. 2. RW sent this picture of part of a Battle of Britain first day cover with the BoB slogan postmark: not easy to get, well done! 3. The 1st class Machin from retail books of 12 has been found but we have no stocks (or pictures) yet. 4. Our website has been updated with two new pages for the September Stampex issues. The Sea Travel Post and Go stamps will be issued on Wednesday 16 September (the first day) at Stampex from Royal Mail Series II machines and in Bureau packs, and at Post Office NCR self-service kiosks in branches around the country. These will be available for all Inland and International Services except for 2nd class mail. Something of a surprise, the stamps do not show the luxury liners that were expected, but the views from those vessels. 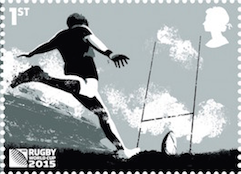 The other Stampex issue is usually on Thursday, but this time the Rugby World Cup special issue will be issued on Friday 18th, as that is the day when the opening match in the tournament is played. On the Thursday, the Animals of World War I Commemorative Sheet will be available, and is shown below. 5. We'll be back on 25th August, part of the time away searching for those elusive 12 x 1st Machin booklets, one of the last of this year's coded red stamps to find. Autumn Stampex Post and Go stamps - no news yet! THE WORST KEPT SECRET OF 2015?